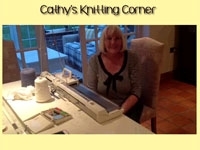 Knit it Now is pleased to introduce our newest contributor, Cathy Serafinowicz! Watch as she knits an unusually shaped baby hat. Never knit a poorly fitting sleeve again! Your knitting pattern has set in sleeves and the upper arm measurement is not right for you. First, learn how changing the upper arm measurement impacts the shape of the sleeve head. Then learn 2 methods of re-charting set in sleeves for a perfect fit! Choose a fabulous, fine yarn, knit a rectangle, stitch one seam, finish the edges (or not) and you have a fun, useful designer poncho, like the one seen at KERISMA KNITS.